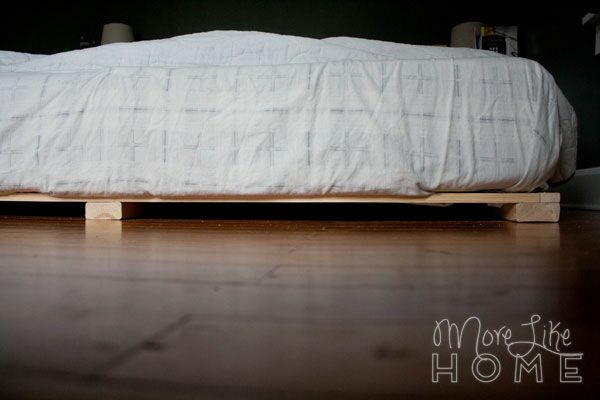 You may have already seen we switched to a floor bed (and built new crate nightstands to go with it) but today we're talking about what's under the bed. Yes, I know the floor is under the bed. 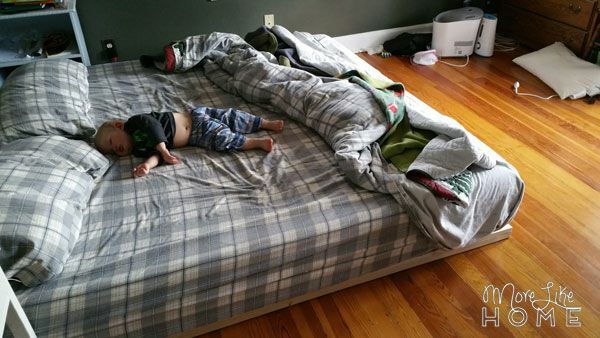 It's a floor bed. But it turns out we actually needed to get it off the floor... without getting it too far off the floor. 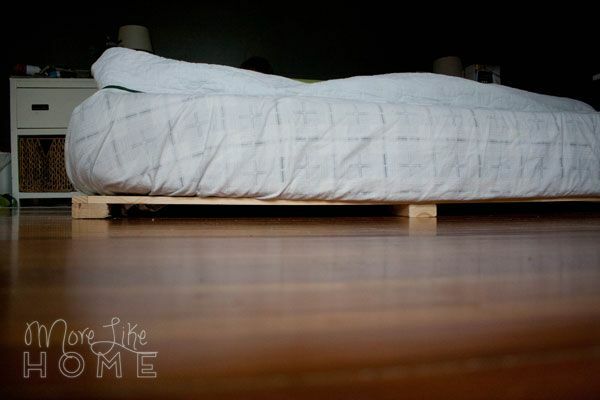 A mattress straight on the floor can trap moisture and land you in a terrible world of mold and mildew. So I'm told. I don't intend to test that theory, but it does make sense. So while we want our bed as near the floor as possible, we also want to allow airflow underneath to keep things fresh. And sanitary. 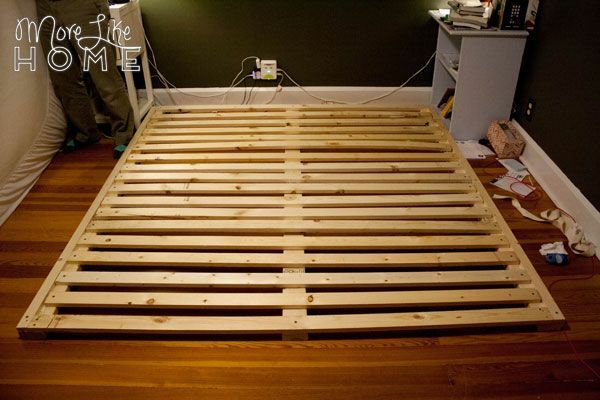 So we built a simple, low-profile slatted bed frame for the mattress to rest on. Problem solved. It was a quick little family project. We squeezed it in one evening after dinner with our little troop of minions at our knees. The littlest one might be the heftiest board-carrier. 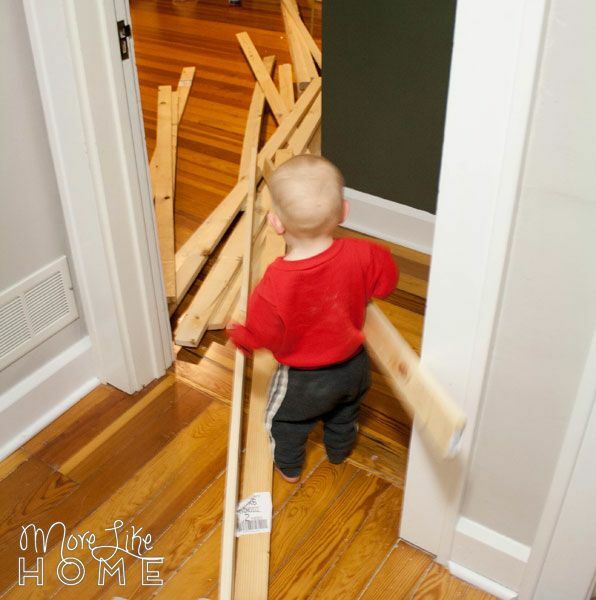 We started by cutting our 2x4s and 1x2s to the length of our mattress, which is 80" long. 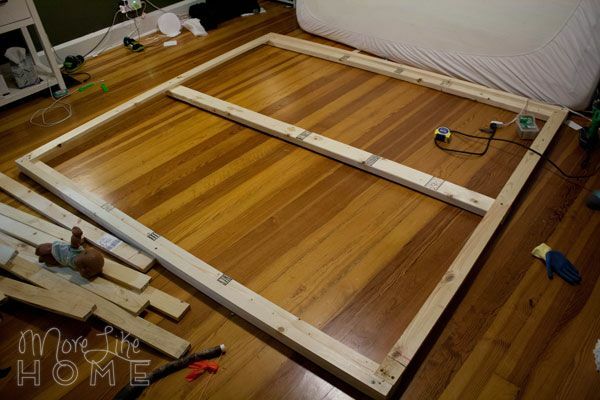 For each side of the bed we stacked a 1x2 on top of a 2x4 and lined up the outside edges. We use 4-5 screws to attach them together (and pre-drilled the holes so the boards wouldn't split). 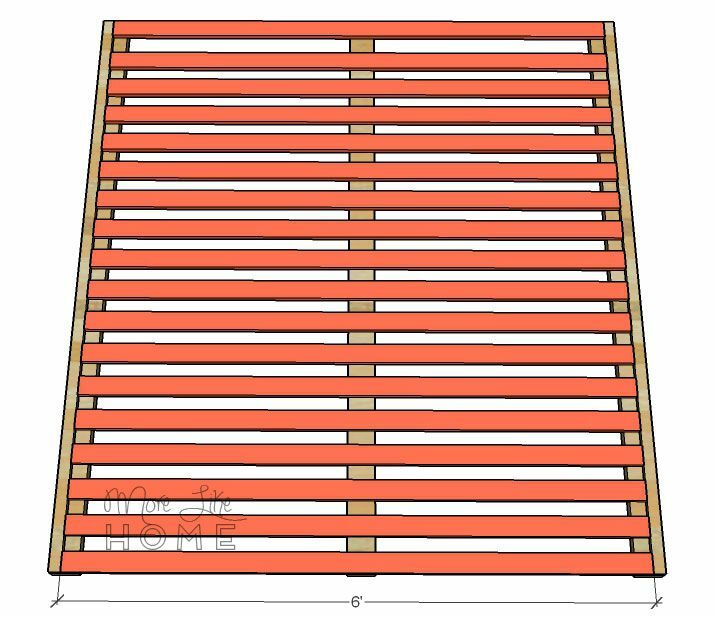 The main reason we used the 1x2s along the edges was because the 6' slat boards were just a couple inches short of reaching the full width of the bed, and the 1x2s finished that length perfectly so we didn't have to cut any of the slats! It was a huge time saver! 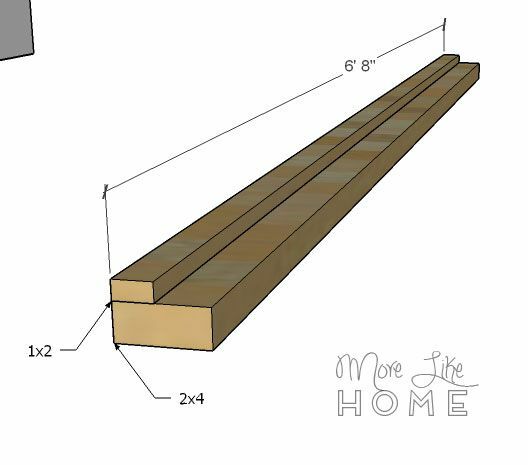 If you're building for a different size bed and need to cut the slats anyway, you could skip the 1x2 and run your slats all the way to the edge of the 2x4 instead. The 1x2 gives it a nicer finished edge on the sides, but omitting it would allow even better airflow between the slats. We laid the side pieces down with the outside edges 75" apart and put the third 2x4 down the middle. We attached a 6' long 1x3 slat at the top and bottom ends of the frame (on top of the 2x4, butting up against the 1x2). 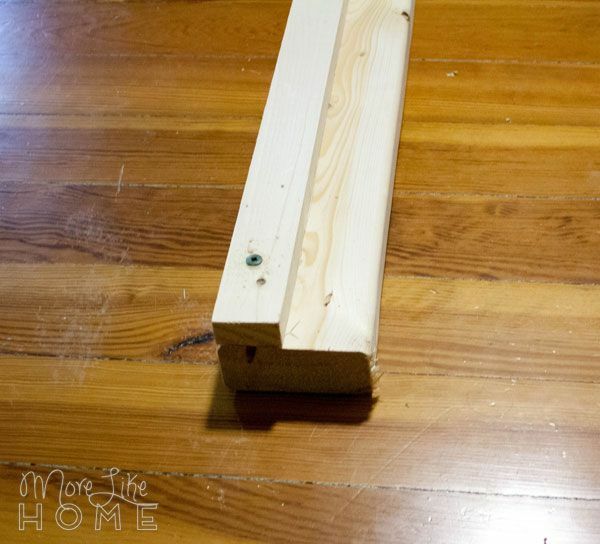 Start with just one screw at each end of the slat and then check to make sure your frame is square. 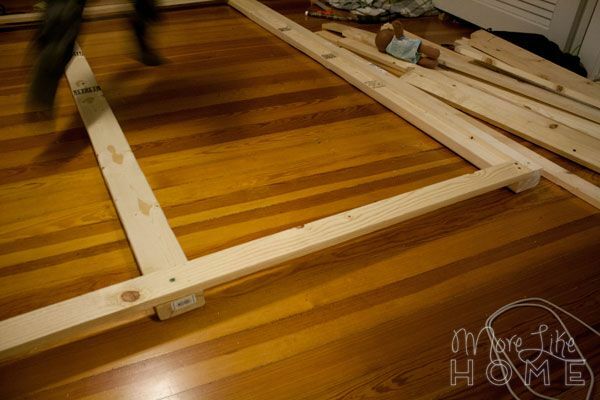 Measure the frame diagonally from corner-to-corner both ways across the bed (top left to bottom right, and top right to bottom left). If the measurements are the same your frame is square. If they are off, you should be able to shift the frame a bit to get them even. 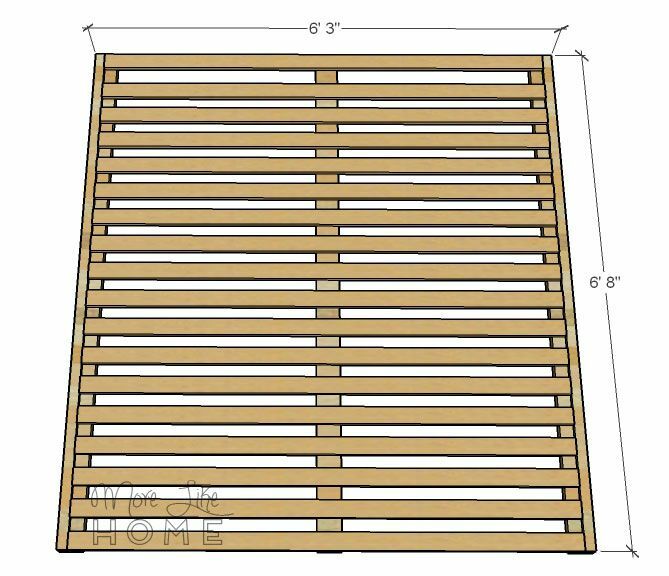 Once you're sure it's square, add a second screw to the ends of each of these slats to keep them from shifting anymore while you finish. Attach the slats to the center 2x4 support to lock it in place. One screw in each end is fine for this. 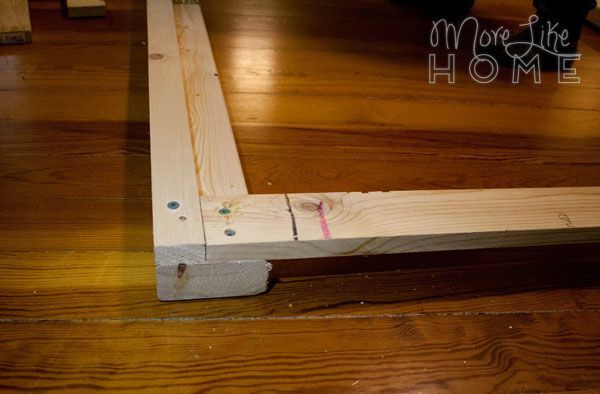 Now you have the skeleton of your frame and can attach the rest of your slats. 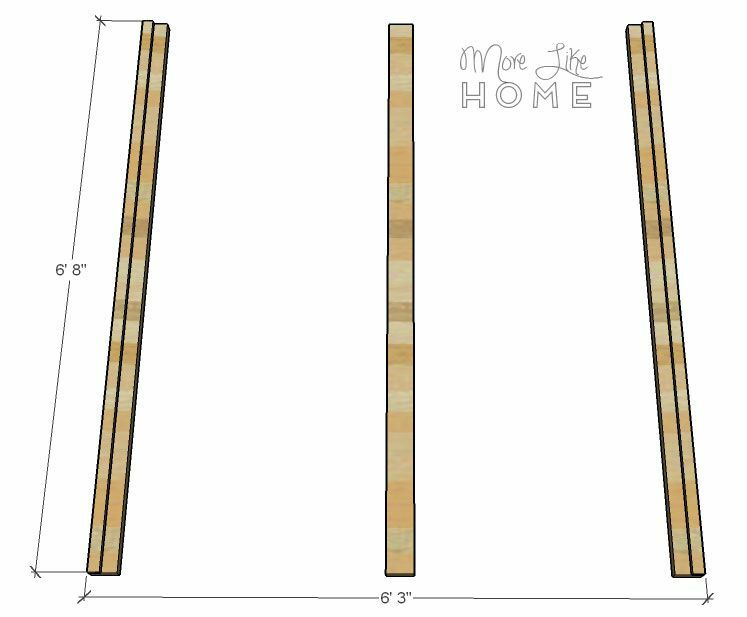 We didn't measure the space between the slats, we just laid them all in there across the 2x4s and spaced them even-ish, then went around and put a screw in the end of each slat. We didn't bother with screws along the center support for these slats - as long as it's attached to the end slats it's not going anywhere. You could finish it with paint or stain and polyurethane if you want, but we let the wood raw. We figured it would barely show anyway, and we'd rather not deal with any of those smells while we sleep. Nevermind the fact I brought some stinky nightstands in our room a few days later. Sshhh. Also nevermind the litter down my side of the bed. Please and thank you. 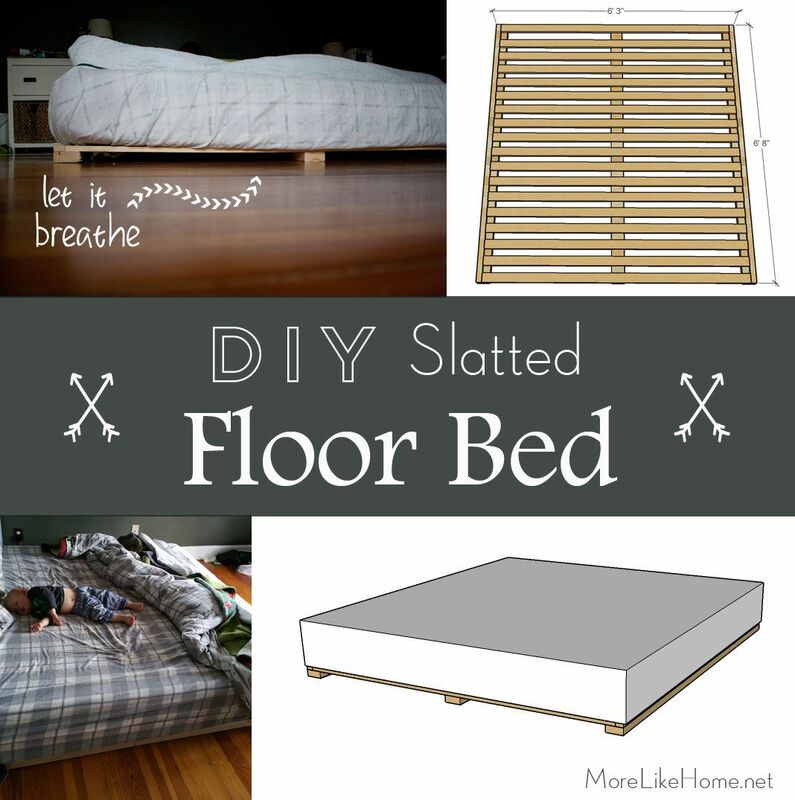 I know I said this in the floor bed post, but I'm just going to leave this little floor bed inspiration right here for you. Again. Because beautiful. I'd say this is the stuff sweet dreams are made of, but I've come to realize it has much less to do than where you're sleeping and much more to do with if your kids are sleeping. Or not. And this one. Okay, I'm done. 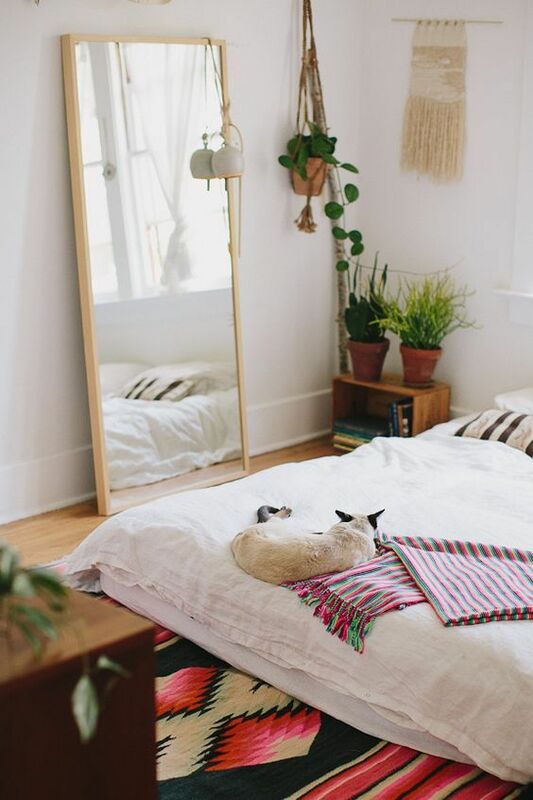 And while we're dreaming about bedrooms, drop a link to your favorite bedroom inspiration down in the comments so we can ooooohhh and aaaahhhh together!